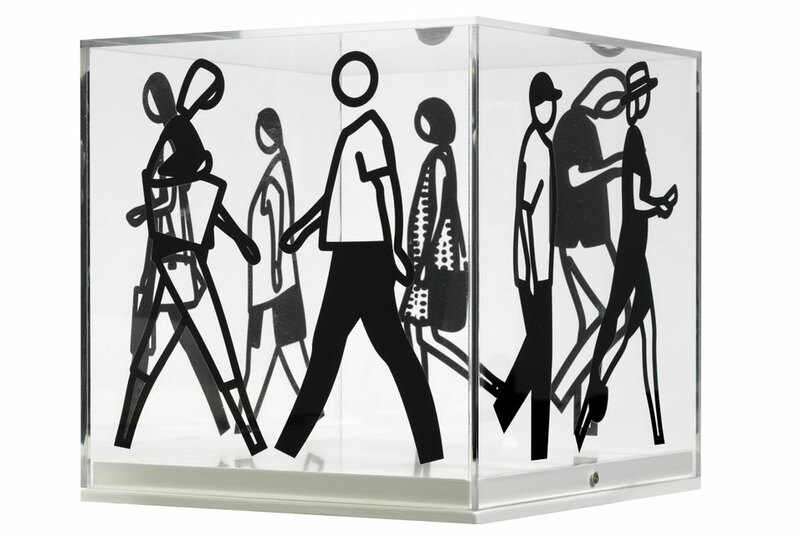 Julian Opie, Walking in Melbourne, 2016. Perspex cube and Vinyl, 20 x 20 x 20 cm. LONDON.- After three busy and highly successful days, the showcase exhibition to launch the new art project Cure3, closed at Bonhams London on 15th March. Considerable advance interest resulted in brisk early sales with 40% of the works finding eager buyers within the first 30 minutes of the opening, including works by Damien Hirst, Grayson Perry, Sir Peter Blake and Peter Doig. Whilst a small handful of art works are still available to purchase via the website, Cure³ has raised over a quarter of a million pounds, with all proceeds going directly towards vital research to find a cure for Parkinsons. Cure³ artists: Rebecca Ackroyd, Alice Anderson, Ron Arad, Hrafnhildur Arnardóttir / Shoplifter, Rana Begum, Tony Bevan, Peter Blake, Willard Boepple, Rob and Nick Carter, Juliana Cerqueira Leite, Daniel Chadwick, Jake and Dinos Chapman, Mat Collishaw, Shezad Dawood, Bouke de Vries, Peter Doig, Knopp Ferro, Margarita Gluzberg, Andy Goldsworthy, Noémie Goudal, Subodh Gupta, Nicholas Hatfull, Sean Henry, Damien Hirst, Henry Hudson, Paul Huxley, Alison Jackson, Ben Johnson, Allen Jones, Idris Khan, Bharti Kher, Rachel Kneebone, Eva LeWitt, Liliane Lijn, George Henry Longly, Sarah Lucas, John McLean, Polly Morgan, Annie Morris, Julian Opie, Grayson Perry, Cathie Pilkington, Stephanie Quayle, Boo Saville, Conrad Shawcross, Yinka Shonibare, Sissi, Amy Stephens, Gavin Turk, Rebecca Warren, Hugo Wilson, Rose Wylie, Jonathan Yeo. 2017 marks the 200th anniversary of the discovery of Parkinsons, and we are delighted that Cure³ proved a fitting event to mark this important milestone. The support given by so many enthusiastic collectors in purchasing works will allow CPT to continue its vital work and we look forward to the next instalment of this new and significant annual event, Cure3.